The movie Defiance: trailer, clips, photos, soundtrack, news and much more! The movie Defiance will get a wide release on January 16, 2009. Courage is the ultimate weapon. Courage and determination are their ultimate weapons to counter the Nazi persecution in the forests of Eastern Europe during World War II. The movie Defiance is a tale of courage and humanity. 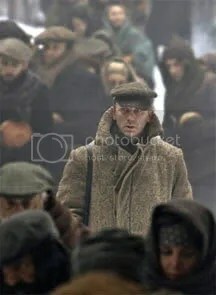 In Defiance two brothers (Daniel Craig and Liev Schreiber) decide, against all odds, to protect a group of Jew refugees from the Nazi persecution during World War II. We are maybe hunted like animals but we will not become animals. Director Zwick’s Defiance seems so great that Paramount has postponed the release of the movie till the end of December 2008 in order to be able to compete for the Oscar. By the summer of 1941 Hitler’s army was on the move. For millions it was a death sentence. But for one man it was a declaration of war. Out of conflict comes courage. Out of battle comes brotherhood. Out of desperation comes defiance. I think Defiance is going to be a really interesting World War II movie. But this cut of this international trailer of Defiance, by focusing on the dark forest, makes the film look like a modern version of Kevin Costner’s Robin Hood:Prince Of Thieves… Not that Kevin Costner movie was that bad, but really hope that Defiance will be better! Actually the resemblance goes beyond the simple physiognomy: Vladimir Putin was a Russian spy, he worked for the KGB and Daniel Craig is the new James Bond. I think the Russian leader should hire Craig to interpret his role in a biography movie! For three brothers an act of vengeance became a journey of hope. Freedom begins with an act of defiance. Unfortunately we still need heroes like them nowadays: half a century ago they were needed in Europe, but today, people are even more in need of such heroes in Darfur….